If you follow With A Blast you should know by now that I love anything, especially food, in miniature size ! These Candy Cane Brownie Bites are just that, about 2 bites and it’s gone. 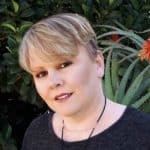 A very good reason to have another one or five ..
A few days ago, I spotted some candy cane at our local Woolworths store and quickly grabbed a couple of containers. Hardly any of our usual stores we go to, keep candy cane in stock at Christmas time, so when I find them, I grab them as if there is no tomorrow ! 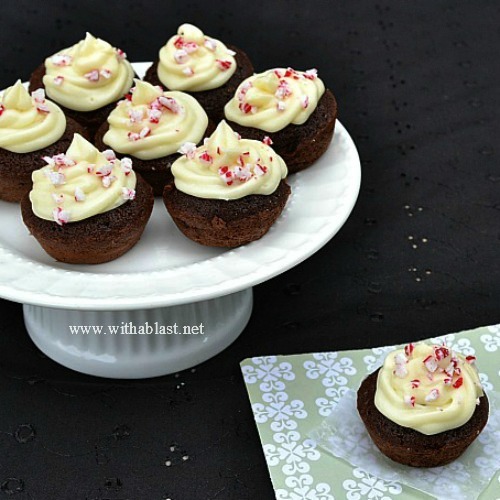 This is a very basic Brownie recipe, moist, very soft and so very chocolatey … You can also make them in a standard cupcake size – but adjust the baking time to around 18 – 20 minutes. 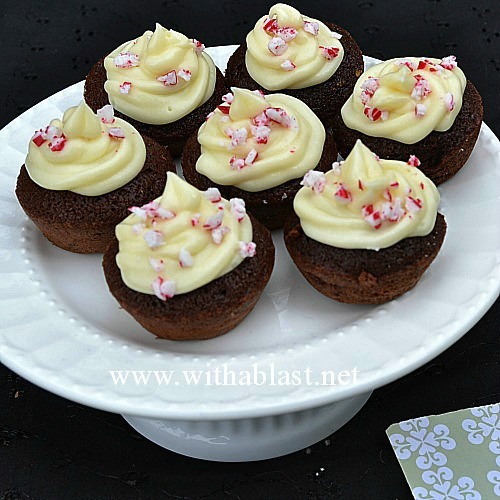 The added White Chocolate to the Frosting makes it not only holding up better and longer, but it also adds a very creamy, chocolate taste, which is wonderful with the slightly sourness of the Cream Cheese. 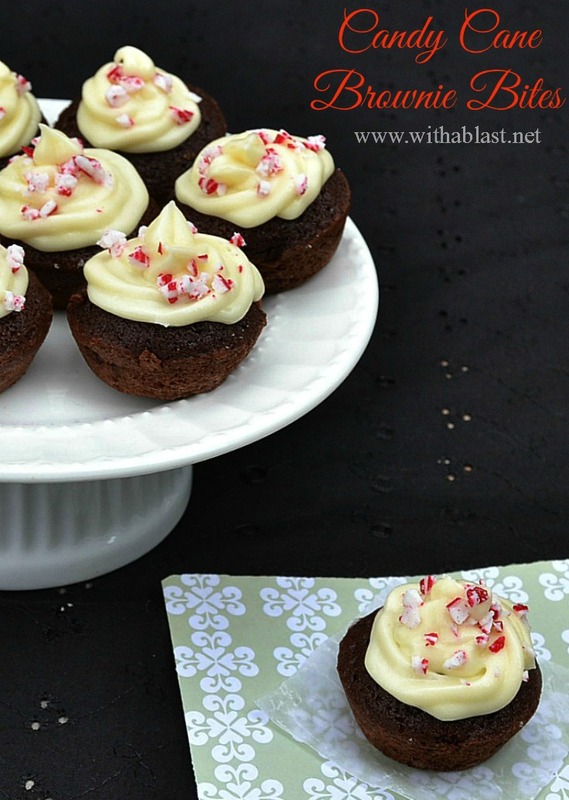 My youngest son loves brownies and anything with peppermint– I think this is the treat made for him– thanks! Mmmmm I'm definitely going to make these this holiday season!!! 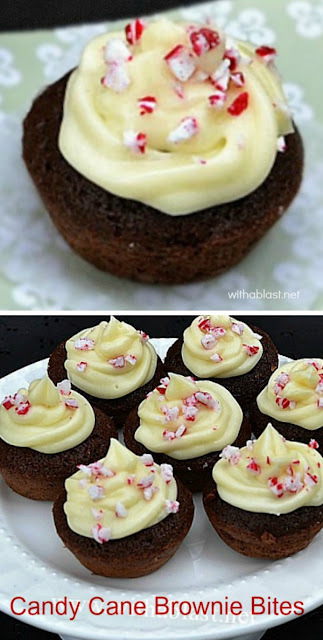 Oooo these look good, thanks for the recipe, I'm pinning for nearer to Christmas. YUM!! miniature bites are usually dangerous for me! i go a little over board and usually just say "well, they were small!" to justify! definitely pinning and trying these bad boys!! Yummy, these look amazing. I have some brownie mix in the pantry. I might have to pick up some cream cheese and try these. YUM! 2 bites is all I need! This looks like a super sweet and yummy recipe! These look so good! They're so cute too! This looks absolutely amazing! I am doing this tonight! Such a great idea! Thanks for sharing! Um? Yum! A must try for sure!